An Ontario Superior Court justice has convicted a 20-year-old man of conspiring in a group plot to bomb several Canadian targets, including Parliament Hill, RCMP headquarters and nuclear power plants. An Ontario judge has convicted a 20-year-old man of conspiring in a group plot to bomb several Canadian targets, including Parliament Hill, RCMP headquarters and nuclear power plants. Ontario Superior Court Judge John Sproat gave his ruling Thursday on the first of 11 people accused in the plot at a courthouse in Brampton, Ont., saying evidence that a terrorist conspiracy existed was "overwhelming." "Planning and working toward ultimate goals that appear unattainable or even unrealistic does not militate against a finding that this was a terrorist group," Sproat said in the ruling. "I also reject the argument that [the alleged ringleader] was a hapless fanatic who posed no risk." Sproat had heard arguments from the defence that the accused had no knowledge of the plot, which was a "jihadi fantasy" brewed by its leaders, while prosecutors maintained he was a willing participant. The accused, who was 17 when he committed his alleged offences and therefore cannot be identified under the Youth Criminal Justice Act, has become the first person in Canada to be convicted under the Anti-terrorism Act passed by the government in 2001. The accused stood motionless as the verdict was read, even as emotions overcame the man's family members, who broke down outside the court, said CBC's Muhammad Lila from the courthouse in Brampton. Although the accused was found guilty, the judge agreed to hold off on entering a formal conviction until a defence appeal is heard in December. The man potentially faces a 10-year sentence. The remaining 10 suspects face charges that stem from allegations they participated in militia-style training camps north of Toronto. They are also accused of plotting to blow up hydro installations and the Canadian Security Intelligence Service and CBC buildings in downtown Toronto. "In terms of the actual terrorism offence, the judge says that the young man did not actually have to be involved in a specific plan … but that he just had to know that this was their intention generally," said the CBC's Ron Charles, who is also covering the trial. 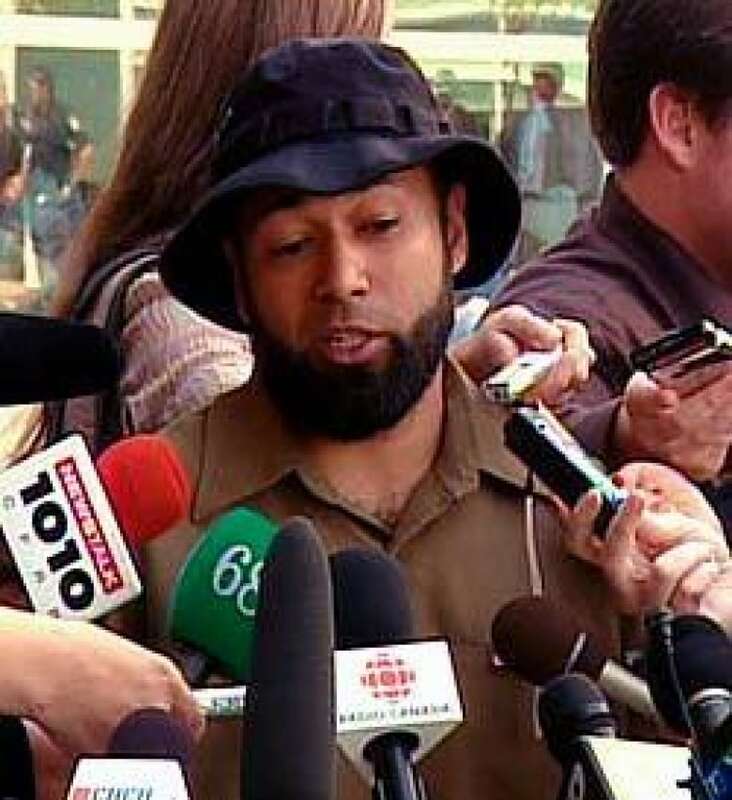 Mubin Shaikh, an RCMP informant in the trial of a member of the 'Toronto 18', speaks to reporters outside the Brampton courthouse on Thursday. ((CBC))The Crown's key witness, paid RCMP informant Mubin Shaikh, had said earlier in the trial that the accused was a recent convert from Hinduism to Islam, and was friendly, respectful of others and eager to please. Testifying on June 16, Shaikh said the youth was otherwise totally ignorant of Islam, world events, or even the plans the group was hatching. Speaking to reporters outside the courtroom on Thursday, Shaikh said, "I don't believe he's a terrorist. "I don't believe he should have been put [through] what he was put through." But Sproat believed the accused "knew what he was doing and continued his association with these people even after he found out what they were all about," said Charles. In what has come to be known as the "Toronto 18" case, 17 Muslim suspects were arrested in a series of dramatic police raids in and around Toronto in June 2006, with an additional man picked up two months later. Police also seized a variety of materials that apparently could be used for making bombs. The Crown has dropped or stayed charges against seven of the suspects since their arrests. "I think undoubtedly the verdict will strike many as surprising, because there was a sense the prosecution's case was falling apart in light of the testimony that was heard," Wesley Wark, an expert on security issues and intelligence, said in an interview with CBC News. "I think the important thing is [the verdict] underlies what is becoming the new reality — that the Anti-terrorism Act is workable piece of legislation that has been tested in the courts," said Wark, who had no involvement in the trial directly. The verdict is sure to stir heated debate over the act that the Liberal government fast-tracked through Parliament in the aftermath of the Sept. 11 attacks in the United States. One of the controversial aspects about the act is "it doesn't require what we usually require in criminal law, which is a full degree of knowledge about a conspiracy that is underway," said Wark. It is too early to tell what kind of precedent the verdict would set for the 10 remaining co-accused, said Wark.